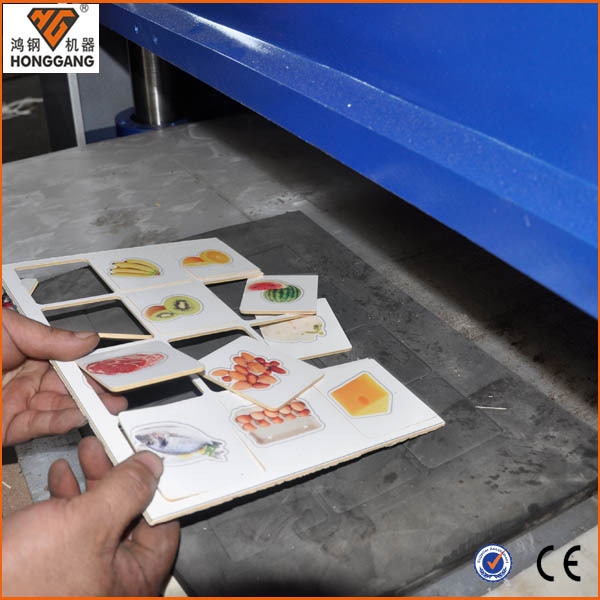 Hydraulic plywood cutting machine is hydraulic die cutting press with cutting tools to plywood toys, plywood puzzle die cutting.Honggang cutting machine is always the type of four columns precise one. 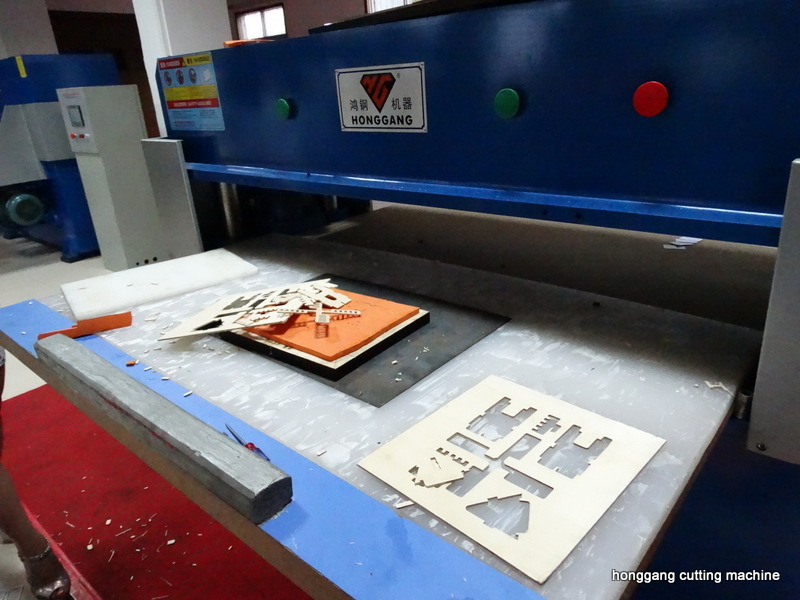 Hydraulic plywood cutting machine can not cut very thick plywood than 5mm as our experience. We have tested many times to confirm it. 2mm, 3mm and 4 mm is no problem but meantime we have to select the hardest density of foam to full fill the cutting die first. Or the cutting process will damage the plywood product and cause cutting egde wringing. Anyway, not all hydraulic cutting machine supplier has the experience in cutting plywood.Hope we can be helpful. Hydraulic plywood cutting machine's key strenth is faster. Laser cutting machine or other automatic cutting machine cut by one line and one line, to be true, in speed, they are slower than hydraulic die cutting while hydraulic die cutting machine can cut by one stroke in one time for long cutting lines and different shapes. 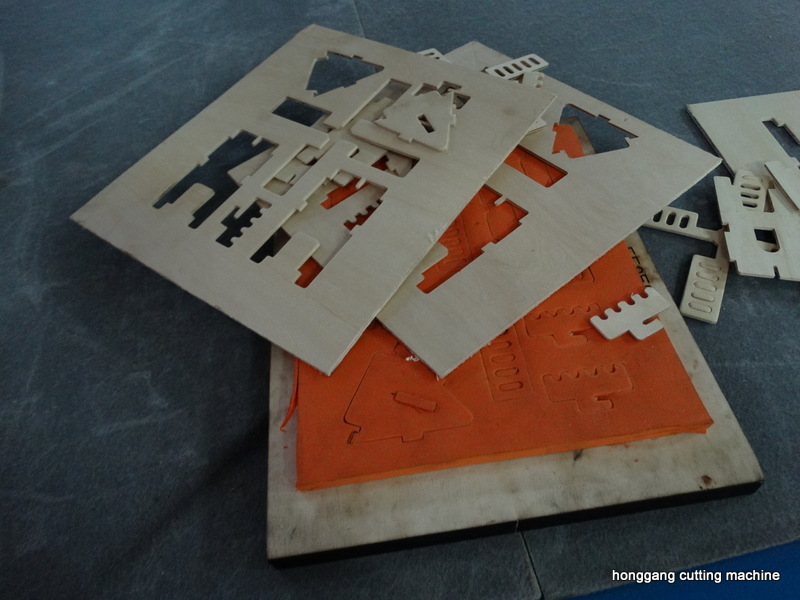 As a conclusion, if for thin plywood, better to use hydraulic cutting machine. To choose hydraulic cutting machine, the cutting force is the key point. As we know that , plywood is harder than leather, fabric, plastic. Small cutting force or mini cutting machine can not be useful for plywood cutting, unless you are cutting very small products. 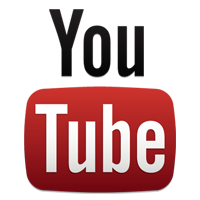 in video, 30 tons is just enough.